We report a successful extraction and sequencing of ancient DNA from carbonized rice grains (Oryza sativa) from six archaeological sites, including two from India and four from Thailand, ranging in age from ca. 2500 to 1500 BP. In total, 221 archaeological grains were processed by PCR amplification and primary-targeted fragments were sequenced for comparison with modern sequences generated from 112 modern rice populations, including crop and wild varieties. Our results include the genetic sequences from both the chloroplast and the nuclear genomes, based on four markers from the chloroplast and six from the nuclear genome. These markers allow differentiation of indica rice from japonica rice, the two major subspecies of Asian rice (O. sativa) considered to have separate geographical origins. One nuclear marker differentiates tropical and temperate forms of subspecies japonica. Other markers relate to phenotypic variation selected for under domestication, such as non-shattering, grain stickiness (waxy starch) and pericarp colour. Recovery and identification of sequences from nuclear markers was generally poor, whereas recovery of chloroplast sequences was successful, with at least one of four markers recovered in 61 % of archaeological grains. This allowed for successful differentiation of indica or japonica subspecies variety, with japonica identified in all the Thai material and a mixture of indica and japonica chloroplasts in the two Indian assemblages. Rice subspecies was also assessed through conventional archaeobotanical methods relying on grain metrics, based on measurements from 13 modern populations and 499 archaeological grains. Grain metrics also suggest a predominance of japonica-type grains in the Southeast Asian sites and a mixture of japonica and indica in the Indian sites with indica in the minority. The similar results of grain metrics and ancient DNA (aDNA) affirm that grain measurements have some degree of reliability in rice subspecies identification. The study also highlights the great potential of ancient DNA recovery from archaeological rice. The data generated in the present study adds support to the model of rice evolution that includes hybridization between japonica and proto-indica. The online version of this article (doi: 10.1007/s12520-015-0236-5) contains supplementary material, which is available to authorized users. 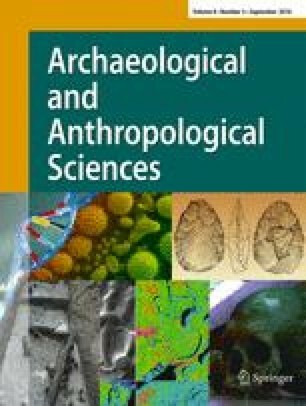 This work was supported by the Sato Project of the Research Institute for Humanity and Nature (RIHN), Japan and the Special Research of Hirosaki University entitled ‘Research Project for Promoting the Utilization of Archaeological Remains’. This is contribution number XXII from the Sato Project of the Research Institute for Humanity and Nature (RIHN), Japan. We would like to thank Robin Allaby, Diane Lister and Mark Thomas for their comments and Dr. Nori Kurata from the National Institute of Genetics, Japan, for kindly supplying seeds of modern rice and DNA of wild rice. The Thai-French archaeological mission in the Upper Thai-Malay peninsula was funded by the ‘commission consultative des fouilles’ of the French Ministry of Foreign Affairs. Further funding was obtained from the Institute of Archaeology, UCL and the Royal Thai Embassy in London for archaeobotanical fieldwork in Thailand. Radiocarbon dating, archaeobotanical analysis and writing by CCC and DQF were supported by a grant from Natural Environment Research Council (NE/K003402/1) on ‘the impact of evolving rice systems from China to Southeast Asia’.